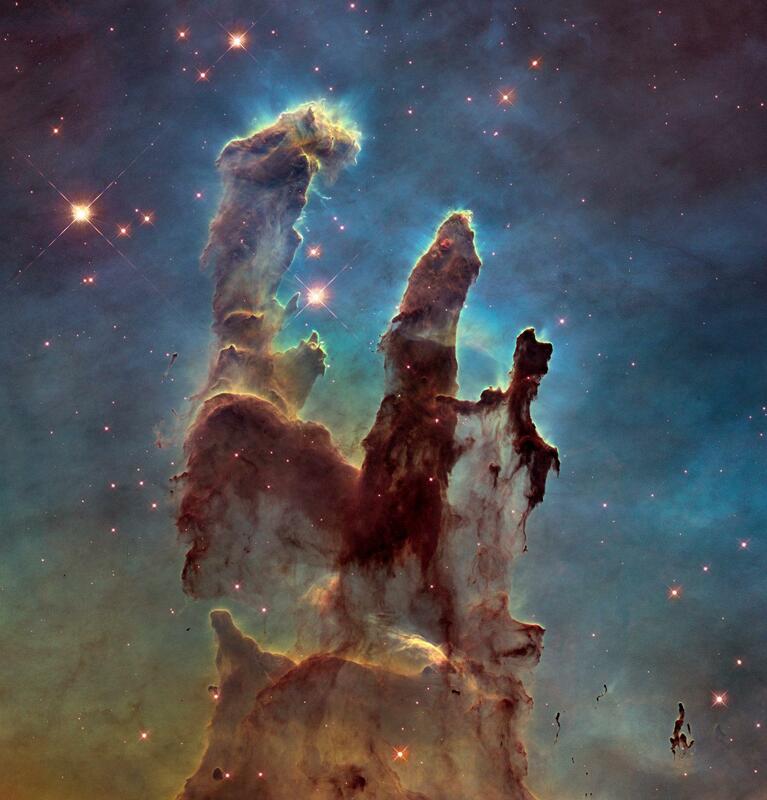 Hubble and M16: Revisiting the Pillars of Creation. 2015 marks the 25th anniversary of the launch of the Hubble Space Telescope. I’m sure I’ll be writing quite a bit about this in the lead-up to the actual event in April, but NASA is already gearing up. They just released an immense and seriously jaw-dropping image of M16, the famous star-forming region nicknamed the Pillars of Creation. The heart of the Eagle Nebula, where stars are being born. Holy. Yikes. And this isn’t even the high-res version; here’s the 6,780 x 7,071 image if you want to choke down the 33 Mb file. And you do, because wow. Hubble originally observed M16 in 1995, and the image became an overnight sensation. It was the first highly detailed look astronomers ever got into a star-forming region, and we immediately learned quite a bit about them. M16 is a huge nebula, thick with gas and dust. All kinds of stars form from this material, from tiny red dwarfs to massive blue monsters. These latter stars are fiercely powerful and radiate vast amounts of ultraviolet light. This light eats away at the dust, destroying it. There are regions in the nebula where the dust is particularly thick, and the UV light washes over and past them, carving huge towers like sandbars in a stream. There have been some changes since the original 1995 observations, too. In this detail, you can see changes in the gas and dust over the 19 years between Hubble observations. In this close-up, you can see a long, thin jet of material, probably being blasted out by a nascent star. 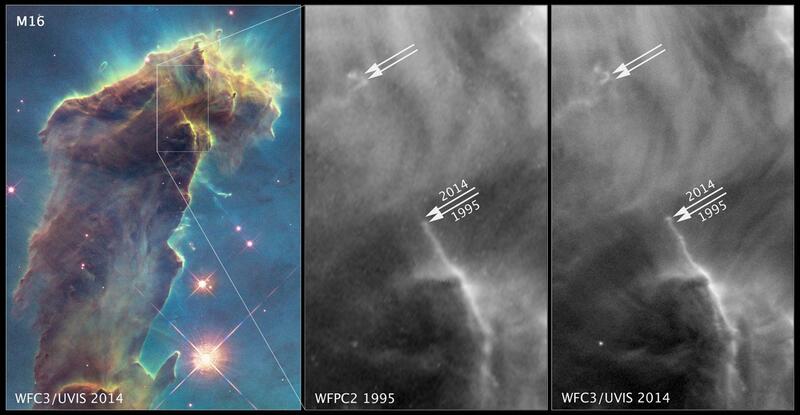 In the middle frame is the picture from 1995, and on the right is the new image (note that in the years since 1995 more powerful cameras have been placed on board Hubble, resulting in higher-resolution images). Given the nebula’s distance of about 6,500 light-years, that jet must now be roughly 100 billion kilometers longer (for comparison, Neptune is less than 5 billion kilometers from the Sun). Material at the tip is barreling through space at more than 700,000 kilometers per hour, fast enough to get from the Earth to the Moon in a half-hour! Obviously, this is more than just a mind-blowing picture. There’s a lot of science here, especially given the nearly two-decade interval between images. Astronomers will be going nearsighted staring at their monitors at this image, examining it in as much detail as they can. We don’t often get to watch changes in structures trillions of kilometers long, so this is a real boon to the science of star formation. And it is also a mind-blowing picture. Back in 1995 it made a pretty big splash and was even used on U.S. stamps (I have a set of my own, in fact). Perhaps after all this time we’re more used to soul-expanding photos from Hubble … but I hope not. This image is gorgeous, and we’ll be seeing more as April approaches.